Home / Commerce and Economy / Business and Corporate / Why NOC faces loss when it sells a litre petrol taking a profit of Rs. 48? Mismanagement and corruption in the state-owned Nepal Oil Corporation are not new things. Its former CEO Gopal Khadka not only earned a bad name for misusing millions of rupees while purchasing land to build storage for fuel a year ago, he even lost the lucrative job due to his corrupt practice. But even after the ousting of Khadka, the situation has not improved in the NOC. It was evident from the increasing losses it has been facing. However, the loss said to be faced by the NOC looks unbelievable because it has been facing loss despite earning Rs. 48 from a litre of petrol. 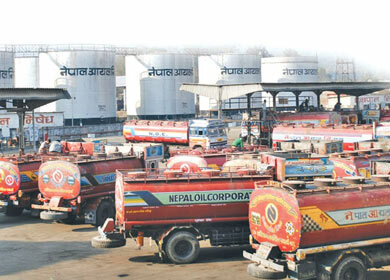 With the increase in the consumption of petrol, Nepal bought fuel worth Rs. 152 billion last fiscal year, and the government collected tax amounting Rs 55 billion from the people for consuming the imported fuel. It is not understandable why the government has been raising such a high amount of tax from essential goods like petrol and kerosene. According to NOC, it pays Rs 62.70 for a litre of petrol to the Indian Oil Corporation (IOC) but sells the same at Rs 110 to the people adding taxes, transportation costs and others. The government collects Rs 38.48 as tax per litre petrol, the NOC gives Rs 4.19 as commission to the dealers and pays Rs 3.37 as transportation costs. Besides, the NOC also makes the consumers pay for administrative cost (Rs. 0.60 per litre) and technical lost (Rs. 0.78 per litre). As a result, a consumer pays Rs. 48 more than the cost price of a litre of petrol. And still the NOC says it is facing a loss of Rs 0.16 per litre! According to NOC, consumption of fuel has been increasing by 20 per cent every year, but no measure has been taken to control the growing consumption of expensive fuel. The government last fiscal year collected Rs 11 billion for the Budhigandaki hydropower project and Rs 5 billion for road construction from the sale of petrol and diesel. The NOC paid income tax amounting to Rs 2 billion last fiscal year, and it is the eighth largest company to pay the income tax to the government. With the increasing import of fuel, the NOC is also facing the problem of storage. Currently, the NOC has a capacity to stor only 72,000 litres fuel across the country. And more money embezzled in the name of buying land to build the storage, and due to corruption, the process to build the storages has been halted. The NOC is selling the kerosene to the poorest of the poor people taking a profit of almost 100 per cent! Although the NOC has become the largest company in terms of transactions, it has failed to make the desired profit. Its annual transaction stands at Rs 200 billion. But it earned a profit of only Rs 3 billion last fiscal year while it had earned nearly 9.5 billion the previous fiscal year.